So the wildlife drawing class that I’m taking is eating up a huge amount of my time because we are supposed to draw things “realistically.” But you guys, I drew this out of my freakin’ head. There was no photo reference for this, other than the thousands of photos of wolves in other easier-to-draw-because-you-can-just-copy-them poses. So we, as students, are supposed to draw things in great detail, but at the same time, come up with compositions that are not based on photographs. This is how brains are broken. I’ll probably display all of these assignments in one gigantic post at the end of the semester, but for now, I’m so proud of this stupid wolf painting that I had to throw it up on the blog by itself. I’m sure, as per tradition, that I’ll look at this painting in a month and wonder how I could ever think it was any good. But for now, let’s admire it and thank caffeine for being a thing that exists. 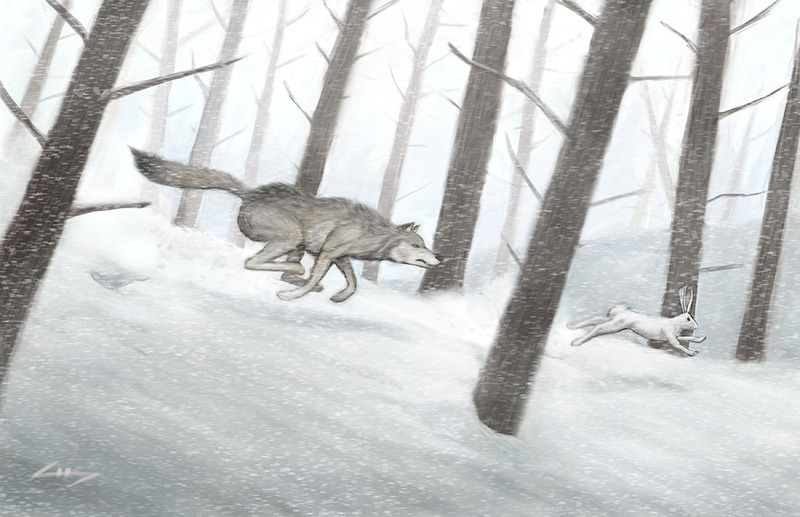 This entry was posted in Art School, Digital Art and tagged gray wolf, gray wolf painting, grey wolf, grey wolf painting, running wolf, wolf in snow, wolf painting, wolf running. Bookmark the permalink.